WHO CAN STAND: Our big news! Congratulations! Wishing you a smooth and easy pregnancy! YAY!!!! So excited for you!! Could not be more thrilled for you guys!!!!!!!!!!! YAY! I'm so excited for you both. Hey, we're expecting too! Our baby is due on January 13th. I haven't usually 'peaked at the package' but this time I'm dying to know, boy or girl. Do you like to know ahead or do you prefer to be surprised? Jake's going to be a big brother, woo-hoo! 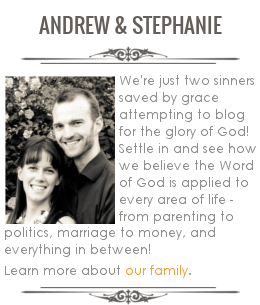 Congratulations, Stephanie and Andrew! I hope you have an easy pregnancy. New blessings being created everyday. The Lord is such a busy one.... so generous, and always about the business of creating and giving.